I would like to take this opportunity to thank you for supporting “Operation BBQ”, VA Beach VA. With your kind donations 11 barbeque competition teams from The Mid Atlantic Barbeque Association and many other volunteers were able to feed 350 Marine’s and their families. All the donations that were received paid for this entire event. These brave heroes’ had just returned home from serving in Iraq and were very grateful for the show of support that the community offered. On March 13th a group of 29 volunteers came together to serve pulled pork bbq, bbq chicken, baked beans, cole slaw, potato salad desserts and drinks to this group of men and women. It was amazing to see the smiles on the faces of the Marine Air Control (MAC 24) unit. Countless times ‘Thank You’ poured in and each and every time a “NO, thank you for keeping us safe” was returned to them as they flowed through the buffet line. I was very privileged to be a part of this event. 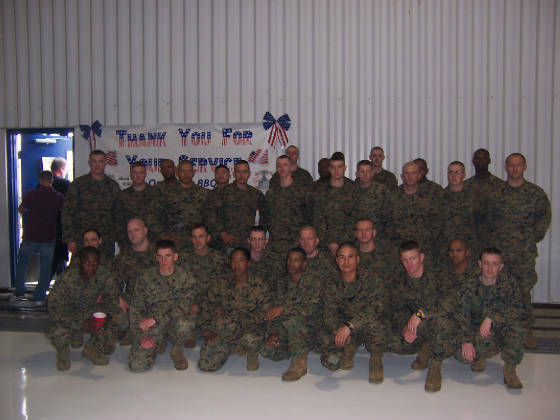 Operation BBQ was born over a few emails from myself and Lance Corporal Varga while he was in Iraq. You see, LC Varga is also a volunteer firefighter at the Zion Crossroads Fire Department where we became friends. I wanted to do something for him and his unit when they got home to show that the community supported out troops. What started out as a small bbq picnic, turned into a much larger event. This Operation BBQ event was as huge success in part by your kind donations. Thank you from all the BBQ Competition Teams, The Zion Crossroads Volunteer Fire Department and the Mid Atlantic Barbeque Association for helping.